Nintendo feels its 3DS launch lineup will be strong, even though its big name first-party title has been pushed past summer. At first, Nintendo wasn't very clear about the games that were planned to launch along with the 3DS in regions other than Japan, creating what it calls a "launch window" that runs from March 27 (the 3DS's release date) through early June rather than an official launch lineup. 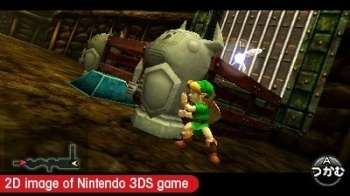 Unfortunately, Nintendo has cleared up some of the confusion surrounding the release of Legend of Zelda: Ocarina of Time 3D and Kid Icarus: Uprising, putting both outside of the launch window completely. Reggie Fils-Aime told MTV Multiplayer that the two highly anticipated first-party titles won't be released until sometime after early June. "Mario, Zelda, all of those titles are coming," Fils-Aime said. "From our perspective, we like to launch titles when they're ready. And so they'll be ready, they'll be ready soon. Just not in that initial time period of late March to early June." Sad making. However, Nintendo points to three other franchises that it hopes and believes will take the place of Zelda and Mario. Fils-Aime spoke highly of Nintendogs + Cats, Pilotwings Resort, and Steel Diver as titles that will keep 3DS players engaged until the big hitters come out. "Between Nintendogs + Cats and Pilotwings, those two franchises, either on the original DS or on other legacy systems like the NES or Super NES, have sold tens of millions of copies," Fils-Aime revealed. "Those two franchises have a lot of strength all by themselves. Steel Diver is a brand new experience, and from a compelling standpoint, we think it's awfully compelling." Fils-Aime also pointed out that beyond first-party games, 3DS owners should look forward to Super Street Fighter IV: 3D Edition, Dead or Alive: Dimensions, and Madden. Looking back at the launch lineups of the Nintendo Wii and the Nintendo DS, I think I might echo Fils-Aime's positivity about the strength of the 3DS's. Wii Sports and Legend of Zelda: Twilight Princess, a GameCube port, carried the Wii through its early stages, while the DS basically had Super Mario 64 DS, an N64 port, to keep it company. Nintendogs + Cats will definitely have an appeal to a certain audience, while Pilotwings Resort might give the Nintendo fanboy/girl something to look forward to if he/she doesn't mind playing as a Mii. Steel Diver still has some convincing to do. I think Ocarina of Time 3D is the closest first-party title that every Nintendo fan should truly look forward to, but things aren't so bad on the first or third-party 3DS launch fronts while we're waiting.